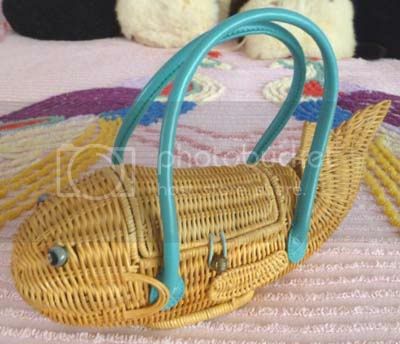 Vintage-Style Modern Wicker Fish Handbag. 2000s. Maker: Cappelli Straworld. This is a newer natural wicker purse, created by designer Cappelli, in the shape of a fish. It has button eyes and turquoise faux leather handles and is very cute. I’ve seen it listed on various sites as a whale, but it’s definitely a fish. I also have a Cappelli dog purse. I’ve included the fish because it fits in nicely with my vintage wicker menagerie. Below is a picture of most of them sitting attentively on the vintage vinyl couch given to me by my friend Tina, a brilliant photographer. 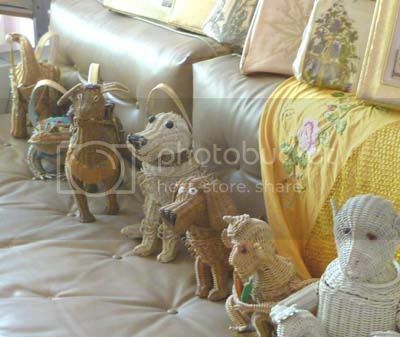 Perched above the two monkeys, two dogs, donkey, frog and elephant (not pictured: vintage Midas of Miami wicker fish) are a number of plastic-coated (just like grandma’s sofa!) vintage bags in a variety of designs. I’m expecting a few more of these within the next week or two, so look for pictures of them soon!